All concrete floors need some type of protective coating or sealer because concrete is a porous material. The coating or sealer that you specify not only protects the floor from abrasions, it enhances the aesthetics of the floor through the variety of textures, staining and other colouring options that are available. A wide range of specialty formulations have been developed to provide superior corrosion protections for concrete floors on the market today. Some of the performance attributes that you can specify include waterproofing coatings for industrial applications, self-cleaning coatings (that allow concrete to keep its colour for longer and provide protection against heat, moisture, abrasion, thermal cycling and high temperatures) as well as surface enhancement options such as dust proofing, non-slip and anti-static characteristics. To make sure you are specifying the right concrete coating or sealer, you will need to understand the function of the floor and impact the floor may experience. Common impact types include chemical exposure, thermal shock, abrasion and impact from equipment and foot traffic. One of the biggest trends in the concrete floor finishing market is polished concrete floors. As a designer, you can transform an existing floor into something completely new with polished concrete. Polished floors are ideal for busy environments because they are durable and easy to clean. You can also specify the sheen level and colours for customised looks. Stained concrete flooring technologies have also enabled customers to recreate nearly any type of colour or pattern on a floor. Stained finishes can also be used to mimic other materials or create a sense of depth in a concrete floor that you don’t want to paint. For a lasting impression, designers can also consider stamped concrete, which adds texture to the floor. Different materials such as brick, stone, tile and wood are also recreated with stamped concrete options. A number of manufacturers are also producing clear acrylic floor sealers intended for use as sealers for concrete and asphalt surfaces. They work well over painted surfaces due to the strong adhesive properties of acrylic, and dry to a semi-gloss finish. Acrylic sealers are typically tack-free dry in about two hours, and are ready for light traffic or for recoating in 24 hours. 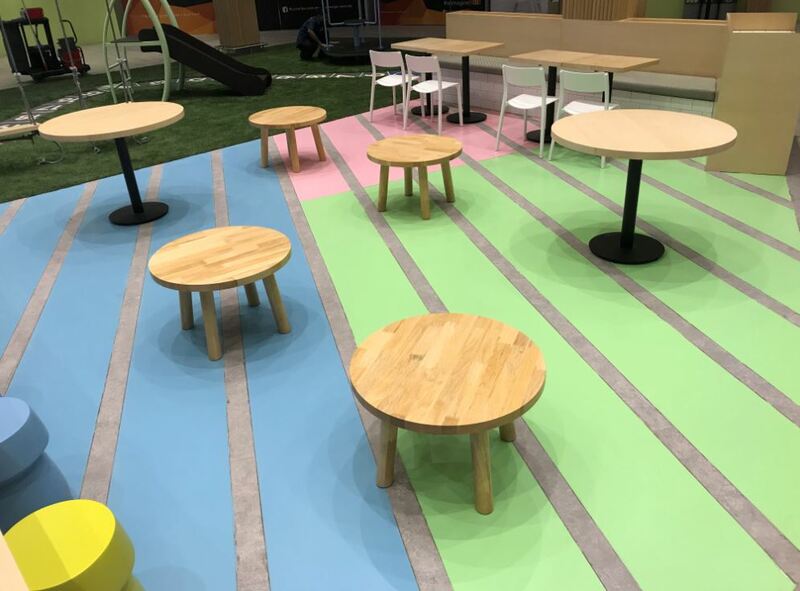 As customisation continues to disrupt the flooring market, experiment with the flooring types mentioned above to create a one-of-a-kind effect for clients. Whether you want a company’s logo in a reception area or a sport team’s symbol, concrete finishes offer the solution. An epoxy floor coating over concrete floors will create a high-gloss, hardwearing and durable surface. Some of the benefits of opting for an epoxy coating include attractive aesthetic options, chemically resistant solutions, improved safety by creating a slip-, impact- and fire-resistant flooring solutions as well as a number of eco-conscious options. Colour chips or epoxy paint chips can also be used to help create a beautiful custom floor coating with just a little creativity. Polyurethane resins offer moderate adhesion but good resistance to shrinkage and flexibility. Polyurethane is available in both water- and oil-based options, and comes in varieties from satin to glossy. Also known as urethanes, this coating offers fast cure times, high abrasion resistance and toughness, and good chemical resistance. There are five major types of wood-based floor coatings namely oil-based urethane, water-based urethane, solvent sealers, waxes and hard wax oil. The type of coating you specify will depend on the aesthetics, performance and maintenance requirements of the client. With an oil-based sealer, for example, the client will have to maintain the floor once or twice a year or risk having to sand back the floor to bare wood and sealing it again. If you maintain an oiled floor properly, that floor will never have to be sanded to bare wood again, so the lifespan of the floor is virtually unlimited. To bring out the richness of the wood, rather opt for a solvent sealer. Hard Wax oils (HWO) require less maintenance than traditional oiled floors. While traditional oils need annual/bi-annual maintenance, HWO normally only get maintained if and when signs of wear starts appearing, or annually in high traffic and commercial applications. Water-based sealers also have a special primer to give the look of a solvent sealer. If you don’t want the floor to change colour (due to the natural oxidization process) over time, a water-based sealer is best. Wood flooring trends are also evolving and developing, offering a new and stylish twist to an old classic. Some of the latest trends in the market include wide plank in grey tones with very low-sheen and extra matt finishes. An increasing number of designers are also specifying wood floors for a more informal layout using different width planks. Many customers are moving away from the predictable and neutral wood flooring appearance, opting for bold looks that make their spaces stand out from the rest. Dark stained wood floors in espresso brown, almost black floors as well as stains that mimic light, bamboo flooring are trendy at the moment. The textures of wood flooring finishes are also changing, with hand-scraped and wire-brushed wood floors being chosen to recreate rustic and handcrafted environments. Specialised tip: The coating or sealer that you specify not only protects the floor from abrasions, it enhances the aesthetics of the floor through a variety of textures, staining and other colouring options that are available. Thanks and acknowledgement are given to www.weber-tylon.co.za, www.floorworx.co.za, www.rubiomonocoat.co.za, http://za.chryso.com, http://abe.co.za, www.garagefloorcoatingofmn.com, www.sebringdesignbuild.com, www.imperialwholesale.com and www.hgtv.com for some of the information contained in this article.